Many are searching for real hope in the face of an economic crisis, in the face of loneliness and emptiness and the illusion of drugs or empty consumerism. Vulnerability is central to the Christmas message, say two of Ireland’s bishops – not only was God made incarnate as a defenceless child, his message was that we must defend the needy. Archbishop Michael Neary of Tuam said in his Christmas message that “At Christmas, God comes to us as a child, vulnerable, wordless, dependent and he evokes a love from us that is free, faithful and joyful. “There was no room for Jesus at the Inn on Christmas night, for the homeless in our society this is their sad experience. In many ways this is a reflection on our society and it presents us with an urgent challenge which we cannot ignore. “We learn our own identity by reflecting on and retelling the story of Christmas. In a sophisticated world we need to approach Christmas with a child-like simplicity and ensure that in the midst of the hustle and bustle we will create space and time for Jesus Christ in our hearts and homes this Christmas. 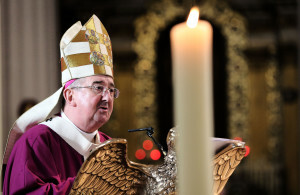 Answering the question, ‘Where then do we find God?’, Dublin’s Catholic Church leader said: “The mystery of Christ’s birth leads us towards the right answer. The Shepherds are led towards the newborn king and then they are given a sign. It is not the sign of luxury or the symbols of power. No they are given a sign that they will find the newborn king in a small baby living without not just the external signs of power: he is born with only the simplest necessities in total contradiction of what we are led to consider power and indeed of how we often consider God and being like God. “The birth of Jesus in powerlessness and poverty teaches us that we seek hope somewhere else than in a constant seeking for power. Rather we should be seeking, to quote again those words of the Prophet Isaiah, ‘to bring light to all those who live in darkness and in a land of deep shadow’. Who knows how many there are not far from us who languish in the land of deep shadow which our world and our culture may ignore and may even have helped to create.